← America’s Top Lobbyists On Criminal Justice Reform- Legal? Proper? Stamps are reserved for history, for settled matters. You know Malcolm X has been officially stationed when he appeared on your stationary. But that troubled era appears more revisited with every passing day. Millions of people waited in prayers and horror as Troy Davis was executed last fall. Most were not convinced of his guilt while many were convinced of his innocence. Now millions more, including the Miami Heat and New York legislators, don hoodies as a man whom most are convinced is guilty walks the streets of Florida. Leftists, Liberals, Anti-Racists and criminal justice reformers call for “Justice” for Trayvon Martin. Justice, in America, typically means a prosecution to the full extent of the law. The term is often invoked for the death penalty, something that Trayvon’s killer might conceivably face in the state of Florida. We have now heard a great deal of commentary on Florida’s “Stand Your Ground” law, including the fact that it likely does not cover George Zimmerman who was explicitly told by a police dispatcher to not follow or approach Trayvon. But this is not about proper punishments for crime, it is about something much bigger: racism. “They killed my son, and now they are trying to destroy his reputation,” Mrs. Martin said in a press conference. “They” are more than Zimmerman, of course. They are those who further the culture of racism, who post false pictures of Trayvon in attempts to make him look “thuggish.” They are those who write blogs mitigating Zimmerman’s behavior or attempting to frame a young boy as dangerous. They are those who believe Black characters in the “Hunger Games” ruined the movie, and those who applauded the near-death of English footballer Fabrice Muamba. As a nation, we are far from stopping the paranoid racism that fuels violence of those such as Zimmerman, however, we should be able to regulate the racism of our public employees. If, for example, Zimmerman had been immediately arrested and charged, even if he were ultimately found innocent under self-defense, there would not be the national outcry of disgust and outrage. What the Sanford Police Department and Seminole County State Attorney’s Office have done is fuel the fires of racism in America. Police Chief Bill Lee claimed he was prohibited by statute from arresting Zimmerman, meanwhile it seems his department applied for an arrest warrant from the A.G. early on. None was issued. Nobody is under any illusions that if a Black man admitted to shooting an unarmed White teenager, there is no statement he could make in his defense that wouldn’t end up in a courtroom. When Black men are arrested for homicide in America, Geraldo Rivera and others do not go out of their way to try and make this understandable. Half a world away, a U.S. soldier killed 17 people in the middle of the night. There has been a great deal of media about the stresses Robert Bales was under, the multiple deployments, his friends who have died in combat, and the anti-malarial drugs that may have psychotic effects. Some, or all, of these things may indeed play a role in acts of extreme violence, yet see how far a PTSD defense gets a kid growing up in Oakland or St. Louis. A few weeks ago, New Orleans police officer Jason Giroir pulled over Justin Sipp’s car, allegedly, for a broken tail light. The facts are unclear except that a shootout left Sipp dead. A few days ago, Giroir posted on a blog, regarding Trayvon Martin, “Act like a Thug Die like one!” He even invited another blog-poster to come to his town with a hoodie and “die like Martin.” Giroir is now suspended while he awaits the results of his shooting investigation. Naturally, the Mayor of New Orleans deemed the officers in that shooting, prior to the results of the investigation, “heroes.” One week later, the NOPD kicked in the door of suspected marijuana dealers and ultimately killed 20 year-old Wendell Allen. A young Black man, but of course. Speaking of presuming guilt and innocence, an off-duty Chicago policeman shot two young Black people, killing 22-year old Rekia Boyd. She has been called an “Innocent Bystander.” Bystander to what? The “alleged gunman” (alleged by the shooter, although nothing corroborates his story) was on a cell phone at the time he was shot, reminiscent of Amadou Diallo and his infamous wallet. The police reaction in this case? It appears to be “justified.” Actually, it appears to be unjustified, even if we suspend our judgment until later. A few years ago in the New Orleans area, the Winnfield coroner contradicted the Winnfield police report: 21 year old Baron Pikes, a young Black man, was killed not by a drug overdose, but by the nine Taser electrocutions- including the final two while he was handcuffed and unresponsive in the back of a police cruiser. The officer was later found not guilty on manslaughter charges. After America watched Oscar Grant killed by BART police on Youtube, calls for “Justice” were not answered by a court system. The six years it took to convict police who killed two Black people in the wake of Katrina, on Danziger Bridge, came across as the old adage “Justice delayed is justice denied.” The five police who pled guilty, and five others who were found guilty by a jury, was followed by a mistrial of a detective involved with the cover-up. In a nation of 300 million and the age of internet, I am never surprised by individual actions, whether tragic or wonderful. If I saw a lottery winner every night on the news, I wouldn’t think we are all winning the lottery. I personally don’t think the murder rate is “high” and people’s civility in the face of poverty, exploitation, and militarism should be applauded. Yet in all these anecdotes that make national news, the racial bias is abundantly clear. Of course some racists went to see Hunger Games, and obviously some of them didn’t read well enough (or read the book at all) to know that many of the characters were people of color. The nonchalance, particularly in government agents sworn to uphold the 14th Amendment’s Equal Protection clause, is the troubling aspect. The last time racist sentiments were this strong, Ronald Reagan was convincing America that Black “Welfare Queens” and Black drug dealers were going to destroy our nation. Three decades later and Anita McLemore is sentenced to three years in federal prison because she did not check the box on a food stamp application indicating she was a convicted felon. Legislatures have people on the defensive with laws to crack down on suspected undocumented immigrants, require Voter ID, and drug test those receiving Temporary Aid to Needy Families. For those who think this all belongs on the Republicans backs, think again. Rhode Island, the most heavily Democratic state in the nation, refuses to legislate against known racial profiling and has passed a Voter ID law that disproportionately impacts urban residents without driver’s licenses. As someone who advocates for solutions that don’t involve guns and prisons, or in the least vastly reduces the usage of guns and cages, it is difficult to demand “Justice for…” in the same manner I typically see. However, it seems obvious that any justice requires a determination of guilt by a jury, not a clearance by one’s co-workers. It seems obvious to me that those sworn to uphold the public trust should be held to a higher standard, both in their use of violence and their pursuit of racial equality. I’m not sure this is obvious to others, but in an ideal world, those co-workers and superiors would wean out any government workers (especially those carrying guns or law degrees) who have improper tendencies regarding Equal Protection. In England, “inciting racial hatred” cost a Tweeter 56 days in jail. Again, I’m not sure if I call that “Justice,” but at least they take the issue seriously. America appears destined for 1965 all over again. This entry was posted in Commentary and tagged civil rights, Danziger, Fabrice Muamba, Florida, New Orleans, NOPD, police, racism, Ronal Serpas, Sanford, Trayvon Martin, wendell allen, Zimmerman. Bookmark the permalink. 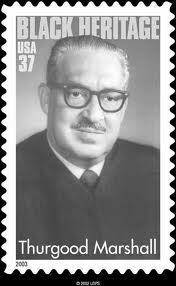 1 Response to Can We Take The Civil RIghts Era OFF The Postage Stamps?